On the UK’s Education Forum newsgroup, where conspiracy theorists from both sides of the pond congregate these days, questions are being raised about the “mystery” surrounding information contained in and on the clipboard mounted in Dallas police officer J.D. Tippit’s squad car. All of these posters seem to be completely ignorant of the fact that the question of what was on Tippit’s clipboard was answered ten years ago in the book “With Malice: Lee Harvey Oswald and the Murder of Officer J.D. Tippit,” (Oak Cliff Press, 1998) the only book ever written on the Tippit case. It’s certainly no surprise that these educators of the Internet conspiracy crowd know little of what’s between the cover boards of “With Malice” given the fact that they regularly trash the author of the book – yours truly – calling him a charlatan, liar, and worse. Figure 1. 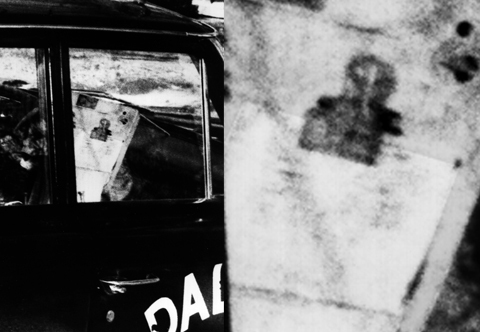 Detail from a Dallas crime scene photograph (#91-001/016) depicting Tippit's dash-mounted clipboard (left) and a closeup of the metal, spring clip clutching an open spiral notebook (right). Allegations had been made for years that the Dallas crime scene photograph seemed to show a mugshot pinned to the clipboard, all of these claims based on multi-generational copies of the photograph. To answer the questions, I went to the source – the Dallas Municipal Archives and Records Center in Dallas, Texas – where I viewed original 1963 prints of the image and obtained new prints pulled from the original 1963 prints as well as new prints from the original negative. And just for the record, while crime lab Sergeant W.E. “Willie” Barnes testified to the Warren Commission that “We never read his clipboard,” former homicide Detective James R. Leavelle, who led the investigation into Tippit’s death, told me in 1983 that he looked at Tippit’s clipboard and there was nothing there to indicate why Tippit stopped Oswald. End of mystery. Did police ever read what was on the dash-mounted clipboard in Tippit's squad car? Yes. Conspiracy theorists have bitterly complained about the apparent lack of interest that the Dallas police had in Tippit's dash-mounted clipboard, citing Dallas police crime lab sergeant W.E. "Pete" Barnes' comment to the Warren Commission in 1964, "We never read his clipboard." (7H274). Traditionally, the clipboard held a spiral notebook which officers could use to write notes on. Theorists speculated that Tippit wrote something on that clipboard that police didn't want the public to know, or perhaps something that contradicted the Warren Commission's conclusion about the murder. But, in 1983, former homicide detective Jim Leavelle, who led the investigation into the Tippit shooting, told me that he did check Tippit's spiral notebook. "I looked at some of the stuff that Tippit had in the car but, to my knowledge, there was nothing ever found - that was written - in regards to the man he stopped," Leavelle told me. "There was no reference as to why he stopped to talk to him. From my own experience, I doubt very seriously that he would have written anything on the clipboard about the man he was stopping. From the way the witnesses described it, Tippit was very nonchalant. It wasn't as though he was expecting anything. He probably figured he'd do a routine check, talk to him, look at his identification, and send him on his way. I know, from my own experience, that I have done that thousands of times - talked to people, maybe look at their identification, and then, send them on their way, and never think another thing about it. I'm sure that's what he had in mind." The Warren Commission was also curious about one crime scene photograph taken of Tippit's car that seemed to show the photograph of a man mounted on Tippit's clipboard. An enlargement of the crime photo referred to by the Commission, however, reveals that the "photograph of a man" is actually the spring, metal clip clutching Tippit's open spiral notebook. I’ve often said that no one will ever learn anything of importance reading the voluminous chatter from the presumed experts on the Kennedy assassination newsgroups. This latest UK Education Forum posting only reaffirms my opinion. WASHINGTON — More than four decades have passed since Marie Tippit lost her husband to John F. Kennedy’s assassin on that fateful November day in Dallas, and on Monday, she got to see J.D. Tippit’s name on a national police memorial, alongside those of thousands of other fallen officers. The rain was falling steadily as the 79-year-old widow made her first visit to the National Law Enforcement Officers Memorial. She rubbed her thumb gently across the marble, pursing her lips. A tear spilled down her cheek as her son patted her back. For Mrs. Tippit, J.D. was more than a footnote to history, or a key piece of evidence to the Warren Commission’s investigation. “He was a good police officer and he was a good husband and father,” she said. On Tuesday, Mrs. Tippit will sit on the dais at a candlelight vigil expected to draw 20,000 to the memorial, a few blocks from the Capitol. “This means a lot to us,” said Craig Floyd, chairman and CEO of the fund that built the memorial in 1991, personally playing tour guide. He showed Mrs. Tippit the marble panel with her husband’s name. Just to the right, the name “John Kennedy” — a New York City police officer killed in 1922, placed there to remind visitors of Officer Tippit’s place in history. “He represents — even though he was killed by the man who killed a president, because of that he just kind of represents a lot of the other officers that were killed in the line of duty, just out there doing their jobs every day,” Mrs. Tippit said. She has long since remarried but often uses the name of her first husband. Life goes on, she said. But just as the world hasn’t forgotten the Kennedy assassination, she thinks often of her first husband. He was 39. That day, Nov. 22, 1963, he stopped home for lunch — not something he often did. She whipped up some tuna and fried potatoes and he rushed back to work. Officer Tippit spotted Lee Harvey Oswald wearing a zipped-up jacket. It was 68 degrees, and the jacket looked out of place. He stopped his patrol car and got out. Oswald pulled a handgun and shot at point-blank range. It was 1:15 p.m., just 45 after the president had been shot. Eyewitnesses called police. Oswald was cornered at the Texas Theater. Mrs. Tippit comes from a law enforcement family. Her father was a police captain in Greenville at the time, and two brothers were officers there. The son who accompanied her to Washington this week, Curtis Tippit, a home contractor who lives in east Dallas, has a son who is considering a police career. “His personality if one of a protector, a take the bull-by-the-horns kind of person. It may have something to do with his grandfather, too,” said Mr. Tippit, who was just shy of his 5th birthday when his father died. Dallas police officers pitched in to send the Tippits to Washington. They arrived Saturday night and got a VIP tour of the White House on Sunday. They were on hand to see Marine One deliver the Bushes after their daughter’s wedding in Crawford. Monday was set aside for the memorial visit. On Tuesday, they’ll visit the Capitol. It’s been thirteen years since I released my preliminary computer-generated JFK assassination reconstruction and five years since an updated version was broadcast world-wide, although you’d never know it given the frequency with which the History and Discovery Channels re-broadcast the two programs my work appeared in. Utilizing screen grabs lifted from the two television programs I participated in, Mr. Speer pretends to debunk my work using graphic overlays that break every rule of photogrammetry accompanied by childish headlines like Dale Myers’ House of Mirrors; Murder by Cartoon; and Cutting the Crap. I pointed out Mr. Speer’s photographic follies on my FAQ page over three years ago (without using his name in order to save him embarrassment), yet Speer continues to use the same deceptive photographic techniques to – get this – claim that he has evidence of my deception. Mr. Speer doesn’t seem to understand that in the real world there is no need to acknowledge something that is self evident – namely, that Discovery Channel viewers were watching a presentation being given from a vantage point that was not perpendicular to the presentation screen. This is obvious from the Discovery program sequences that show a wide-angle view of the studio in which the presentation was being given. Mr. Speer failed to note that fact and now claims that the Discovery Channel and yours truly conspired to deceive everyone about the single bullet theory. The so-called distortions Mr. Speer refers to are of course the unintended result of the Discovery Channel photographing the presentation monitor at an angle and have nothing to do with the alignments depicted in the actual images appearing on the monitor. And the trajectory path superimposed over the videotaped sequence by Discovery editors after the fact has no more relevance or accuracy to the images below it (other than to illustrate, in very broad terms, the path of the bullet) than Mr. Speer’s own attempts to project two-dimensional lines into three-dimensional space. Mr. Speer further complains that the animated sequence I produced in which Connally is shown sitting inboard of Kennedy by six inches is equally deceptively because it shows Connally and the jumpseat moving in unison. I explained in a recent email that Connally and the jumpseat were moved as one for clarity. I don’t know how many ways to say it, but Connally was situated six inches inboard of Kennedy at the time they were both hit. Connally’s jumpseat, however, was fixed to a track in the floor of the limousine, the outside edge of the jumpseat cushion measured at 2.5 inches from the inside door panel, according to body drafts produced by Hess & Eisenhardt Company. To demonstrate the difference between a rather common (and inaccurate) drawing purporting to show Connally seated directly in front of Kennedy at the time of the single bullet shot and their actual positions as deduced from the Zapruder film and other photographs, the models of Connally and the jumpseat were moved as a single unit during presentations for ABC News and the Discovery Channel. Congratulations, Mr. Speer! You’re tops with me.